Political Science Research and Methods (PSRM) is a general political science journal dedicated to publishing original scholarly work of the highest quality from all subfields of political science. The journal specifically focuses on research applying rigorous methods to empirical or theoretical problems and promotes a rigorous scientific approach to the study of politics. PSRM welcomes work at the intersection of political science and related disciplines such as economics and sociology. 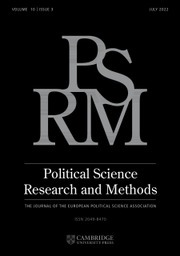 PSRM is the official journal of the European Political Science Association (EPSA) and strives to become one of the leading journals in Political Science. PSRM will publish four issues a year from 2017.